Many of you have written to ask me what you can do to help the victims in Nepal. I wanted to give you a few options to choose from if you would like to help financially. These are the three I have chosen to donate to based on their reputation and the amount they donate directly to the cause (and not staff overhead). 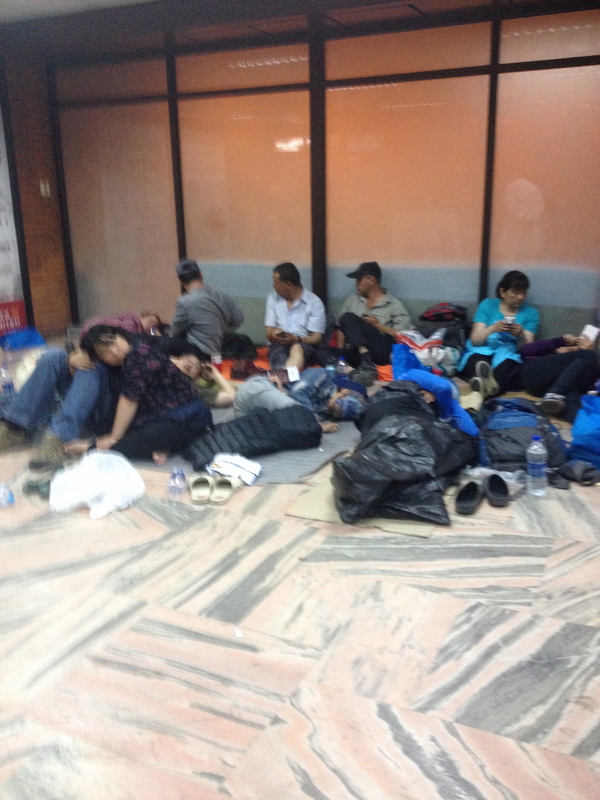 The immediate needs in Nepal are medical supplies, food, and water. The long term needs will be rebuilding infrastructure and construction. 1) For immediate clean water: Charity Water based out of New York is providing clean water to those desperately in need in the hardest hit areas of Nepal. 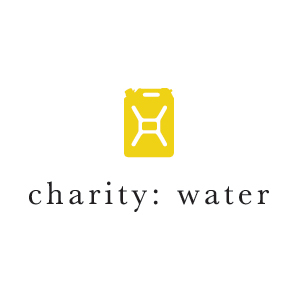 Charity Water has a 4 star rating on Charity Navigator, donating 100% of your contributions directly to the cause. 2) For immediate medical relief work: Project Cure based out of Colorado is providing medical supplies and equipment to doctors and nurses on the ground in Nepal who are desperately in need. Project Cure has a 4 star rating on Charity Navigator, donating 98.4% of your contributions directly to the cause. 3) For long term relief work: One Day's Wages based out of Seattle, WA is raising funds to provide long term relief and care after the immediate needs are met. One Day's Wages donates 100% of your money directly to the cause. Thank you all so much for your thoughts and prayers during this last week in Nepal. Returning home I am experiencing mixed emotions, glad to be home safe, but desperately wanting to be back with friends in Nepal. I wish I could call and tell each of you the story but since that is not possible I'd like to recount it here. I don't know how this experience has changed me but I know it has, deeply. Saturday was my only day off in Kathmandu. My local friends and colleagues were planning a day for me in the city. That morning I was feeling anxious to leave and get out of our building. The ladies with me were still getting ready and our friend/driver had not yet arrived. I told them I was going to go to a cafe down the street for a bit. When I got there it was closed so I enjoyed a stroll through the neighborhood. Taking photos of buildings I liked, and flowers. We left around 10:30 in the morning. We decided to first head to Patan, and area of Kathmandu with many temples and historical sites, as well as an old traditional city. All is within walking distance of each other so this was a great place to start. The architecture was ornate, full of religious symbolism, with beautiful paintings and carvings. I was soaking it all in. 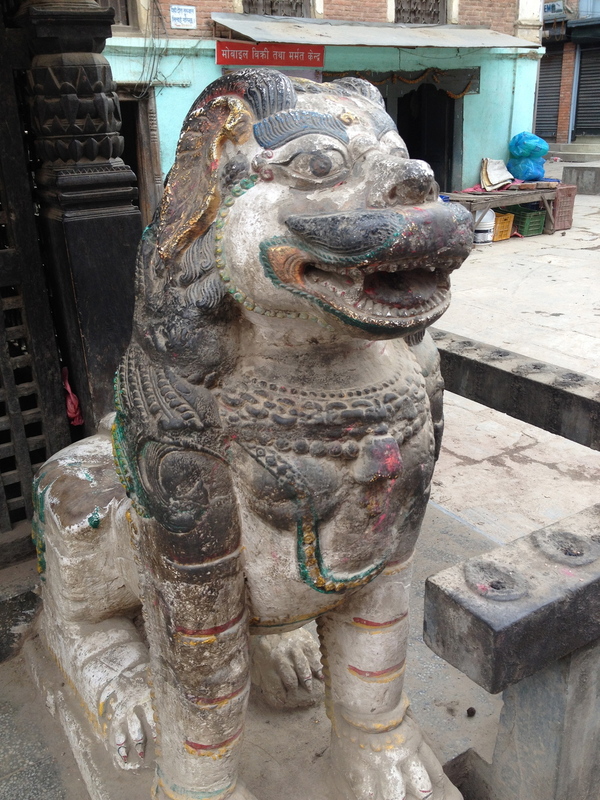 When we arrived to the main area of Durbar Square in Patan I was amazed at the temples ahead. As we got closer I noticed that was just the tip of the iceberg. There were so many temples on this promenade. All reflecting a certain period of history and architecture ranging from wood to stone to brick. We strolled through, people watching, taking photos of the structures, playing on the structures. We began walking back through the promenade and through the town, back to the car. As we were driving I was turned to the back seat talking to the girls. I had my phone in hand showing photos when our driver said "Oh my goodness, oh my goodness!" I thought maybe a person or animal had run into the street ahead of us. I turned around and when I did the buildings were all swaying as if on an ocean wave. Power lines were shaking. Bricks were falling and dust being kicked up. People were running into the street and the car was shaking side ways. I had my camera in hand so I snapped these photos of the very beginning of the 7.9 earthquake, then dropped it. We drove forward looking for a safe place, dodging people, power lines, toppled over motorbikes, and brick sidewalks that shot out into the street. We found a garden area by a school so we stopped in front of it and waited for the shaking to stop. We got out of the car trying to see if there was anyone who needed help, but there were no collapsed buildings around us. We stayed in the garden for the next hour with others from the area listening to the earth groan and pop underneath us and riding the slides and jerks of the aftershocks. We decided to meet my colleague from Aid Through Trade whom I was working with these past weeks. He was about 10 minutes down the road. The home he was staying at was across from a water well surrounded by a park. We drove there through much debris and people in shock. My colleague was inside the house when it happened, and I can imagine the trauma from not knowing if the house was going to collapse amidst glass breaking and everything falling off shelves. 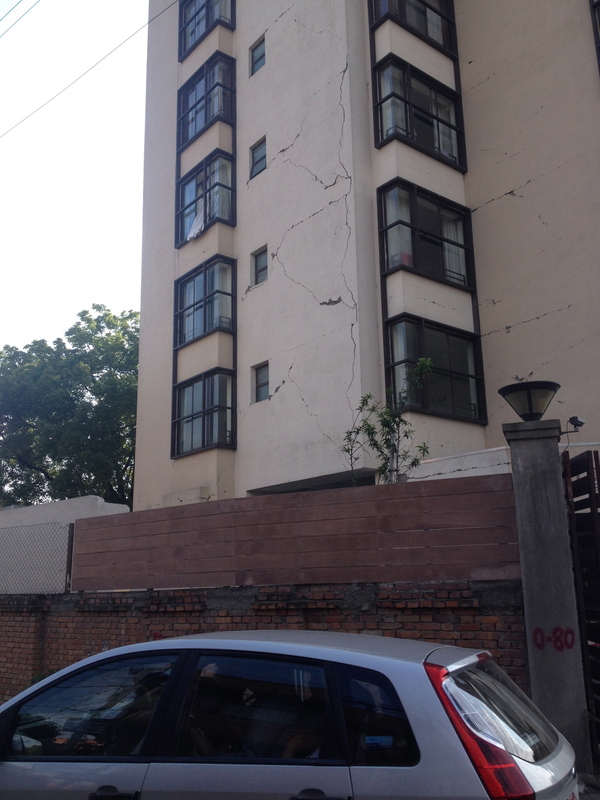 Structural integrity is one of my greatest fears in traveling. We arrived at the park where majority of the neighborhood had already gathered. The rest of the day would be spent here. Aftershocks were coming every hour. Small ones. Big ones. Jerking ones. Rocking ones. No one knew if a another big one was coming. Throughout the next few hours people were bringing the elderly from their homes. There were kids and babies. We all held on to one another. After many hours people started to bring bananas and nuts and maggie/ramen noodles to eat. Since the well was on the property there was no shortage of drinking water. When evening came many started preparing to sleep in the fields. People ran into their homes to grab blankets and tarps. The tent city was erected. We went back to the house because it was just across the street by a stones throw. We began setting up a tent structure with tables and sheets. We would quickly run into the house to get water, use the toilet, cook food, but every time felt like playing russian roulette. You never knew when another quake would come and you never knew how bad it would be so every movement was calculated, being hyper aware of what could fall on you. 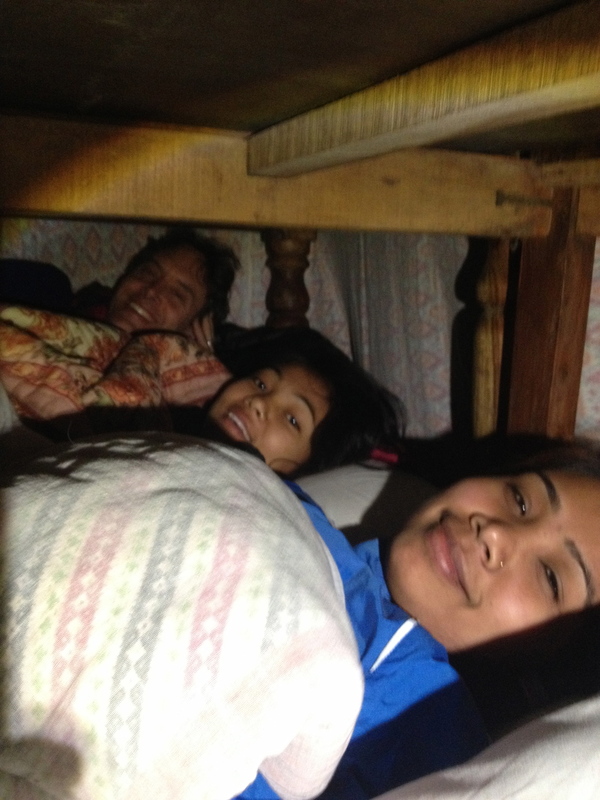 We hunkered down into our fort and throughout the night rode out the aftershocks. In the silence of the night the sounds from the earth were frightening. You could hear a deep groan and then a shake would come. It was like clock work every one to two hours. On Sunday our internet went out. It was hard not to be in touch with the outside world, mainly to let everyone know we were okay. We had set a table and chairs in the yard and that is where we hung out all day. We would go from laughing and joking, to running to the open part of the yard in fetal position cradling our head. About two hours went by with no movement so we decided to go inside and cook some food. About 20 minutes later another 6.6 earthquake came. We all ran outside as fast as possible, staying low to the ground and watching for falling trees, structures, and power lines above us. This one lasted a while but was more like the earthquakes I had experienced in California- Bouncing in the beginning and gently flowing back and forth like a boat. A neighbor came over to share extra vegetables from his garden. He sat and talked to us for a bit. He wanted to show us his furniture workshop and the home that collapsed killing 2 children down the street. We followed him about a couple of blocks away from where we were staying. Afterwards we sat in the fields with his family. Everyone was talking and preparing for the rain to come that night. We were unsure if we would stay in the field or back in our yard for the night but since we didn't have a plastic tarp we decided to go back to the house. Another night in darkness and uncertainty. Curling in a ball every hour. Being washed on all sides by the rain. But finding comfort hugging the earth and each other. Happy to have mosquitos swarming our warmth, confirming that life-blood was still in our veins. At 5am the earth dropped waking us all up. It was now Monday. We were scheduled to fly out that night but were unsure what the airport situation would be like. We went back to the office, where I was also staying, to gather my things. There were people outside starting to fix the power lines. The retaining wall down the driveway had fallen and majority of the shelves with beads were on the ground inside. The home I had taken a photo of in the beginning of this post was now uninhabitable. On the way to the airport the breadth of the destruction could be seen- Cracked roads, fallen walls, collapsed buildings, badly damaged buildings. There will be a lot of clean up in the near future, but for the moment everyone was just trying to survive and wait for the shaking to stop. 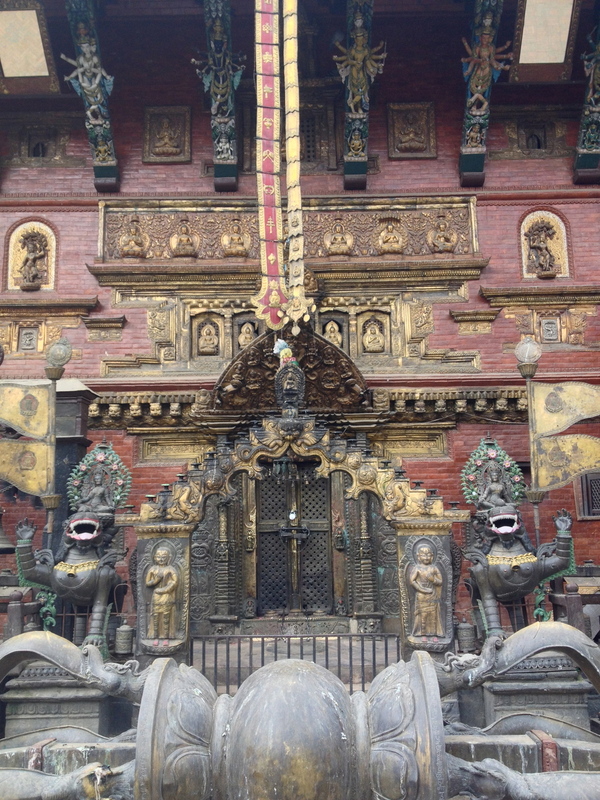 Here are also before/after photos of Durbar Square 21 minutes after we left. The airport was overflowing with people. My colleague who has been to Nepal countless times since the early 1980's had never seen so many people there. Everything felt like chaos. There were minimal systems in place but no one to explain what those systems were. Long story short, by the time we got to the gate we realized there were people who had been there since Saturday trying to leave. People were camped out sleeping. Trash was everywhere. Our flight was scheduled at 9:30pm and we finally took off at Midnight. I considered us VERY lucky. I had a long layover in Doha with my colleague and we were able to start processing the trip. The tears began to flow, but we were trying to hold them back. Now that I am home I am wishing I was still in Nepal. I'm seeing the cavern of difference in the way we process tragedy here in the west. In the past I have looked at these situations as so hopeless, especially for the people in the midst of them. But being there it didn't feel that way. Everyone comes together and helps each other. You are never alone. In the west we are so focused on self-care and over there you are walking it out very intimately with the community 24/7. The burden doesn't fell as great because you are all together- surviving, crying, laughing, celebrating. Having that experience has changed me forever. 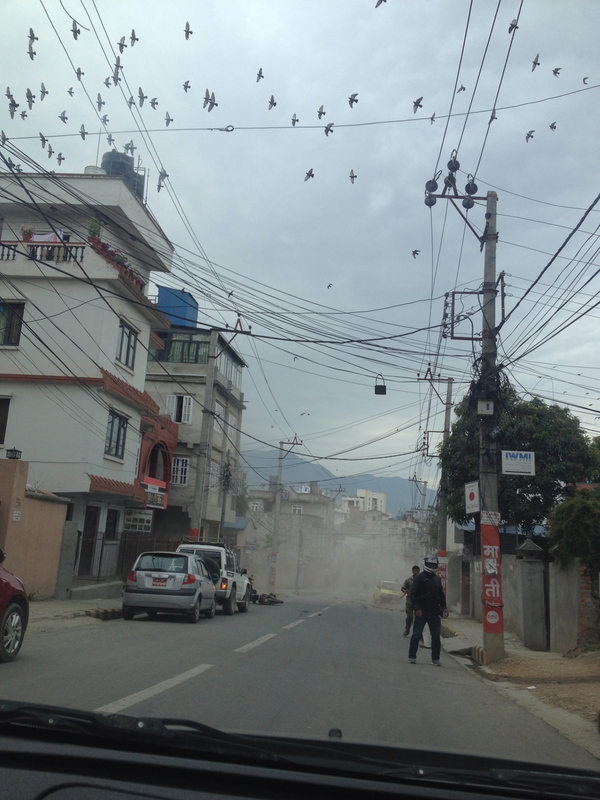 I am so thankful for this trip and for the resiliency and joy of the Nepali people in the midsts of so much tragedy. I look forward to returning in the future. Please join us for an opening reception during the Santiago Street Lofts Art Walk on 21 March from 7-10p, and/or closing reception during the Santa Ana Art Walk on 04 April 6-8p. Living in places like Dallas, Los Angeles, Austin, and Brooklyn has given me the honor of knowing some highly creative, imaginative, and entrepreneurial people that I constantly draw inspiration from. A few months back I was approached by F+ Gallery in Santa Ana, CA about curating an art show at the end of this month. I felt thrilled, not only to exercise the craft of curation (which I do as a collection designer) in a new art realm, but also to highlight some of the brilliant artists that I know in my community. Over the next few weeks I'll be posting more information and introducing these artists to you. Stay tuned! Groundswell raised over $220,000 through the donations/purchases of art at the event last week. Watch this video to see how they are affecting communities and youth in Brooklyn, NY. A wonderful night of friends, food, and drink while raising funds and celebrating the work of Groundswell in the community. Photo courtesy of Groundswell. I'm so happy for my friend and colleague Rachel Faller for starting her new brand Tonlé. Through working with her for a few years during my time with Raven + Lily I have learned so much by seeing first hand the way she runs her business and is involved in the fair trade/ethical fashion community in Cambodia. She is passionate, energetic, creative, and a savvy business woman. I just received an email about her kickstarter campaign and immediately went to donate. You must see the über creative video they made using scrap fabric animations for their illustrations! It is companies like hers that are making a difference in this world, not just for the people she works with, but also for the environment. Watch the video to see just what it means for a garment business to be zero waste. It takes a lot of creativity, time investment, and a passion for the planet to accomplish such a feat. It is an honor to know her and I hope you can support either through the campaign or by purchasing Tonlé products. This weekend in Brooklyn I will be participating in opening my studio for the Gowanus Open Studios art walk. Please stop by and say hi! There are so many wonderful companies these days doing good and impactful work, and Love 41 is one of them. Tina and Suzette, sisters and founders, do an excellent job at providing handbags that are functional and classic with high quality construction, and a cause to back it all up. Check out their website Love 41 and see for yourself. I was able to style and produce a photo shoot for them with photographer Kelsey Foster in Dallas, Texas. It was easy to feel inspired by the bags we were shooting for each look. I'm in love with Lana! This weekend bag will get you to wherever you need to go but, beware, you may be stopped by multiple people commenting on how much they love it! Plan your travel time accordingly.